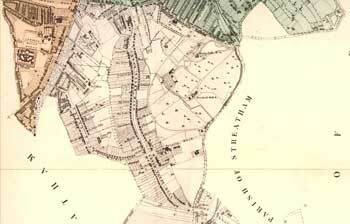 A map showing the area between Brixton Hill, Brockwell Park and Norwood Lane (now Norwood Road). Through the middle, running north to south, are Upper and Lower Tulse Hill, developed as parish highways in 1822. 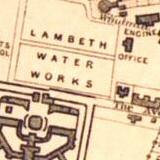 On the west side of Brixton Hill the windmill can be seen, along with the reservoir and Brixton Prison, used at that time for women. The Tulse Hill Hotel is shown at the junction of Tulse Hill and Norwood Lane. Wealthy families began to build substantial villas with large gardens in this area from the middle of the 18th century. Brockwell Hall, built in 1813, survived as the one remaining country house in its own parkland.